I have been following the autoimmune paleo diet since March of this year as part of my functional medicine approach to healing leaky gut (1st two links). I followed it strictly for about 60 days and I've been slowly but surely reintroducing foods now and I am currently eating a modified AIP diet that includes things like eggs, chocolate, white potatoes, and many seeds and seed-based spices. Unfortunately, the fruit-type nightshades seem to be a problem for me and tomatoes are definitely out for now and I can only do sweet peppers in moderation. 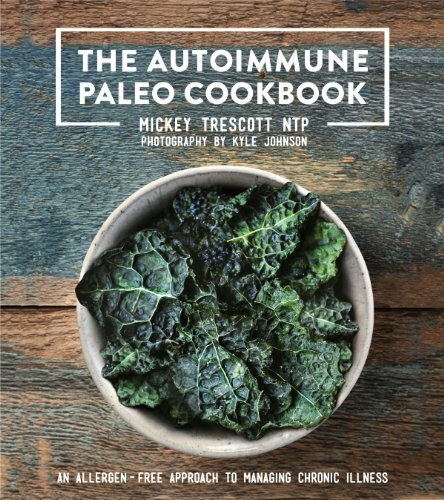 The #1 thing that I have been most grateful to have in my life during my time on the AIP is The Autoimmune Paleo Cookbook by Mickey Trescott. She sent me a review copy several months ago and I've been cooking out of it frequently ever since. It's so beautifully photographed -- every single recipe has a mouth-watering photo to accompany it. I have a hard time purchasing cookbooks these days that DON'T include photos of every recipe, so this is a big plus for this book. It is also extremely comprehensive and is perfect for you if you have never done the AIP and are feeling lost and unsure how you'll feed yourself with so many restrictions. The good news is that Mickey wrote the intro of the book just for you. In it, she goes into detail explaining the diet, how to stock your pantry, how to equip your kitchen, how to make staple items like bone broth, coconut milk, rendered animal fat (and lots more tips and tricks), and she even helps you with batch cooking and meal planning. One of the most helpful resources in this book is the 4-week meal plan + shopping list to help you get through your first month on the diet. About 220 pages of this cookbook are devoted just to delicious recipes, and they are all 100% AIP, for the initial phase of the elimination diet. Some people need to stay on the full AIP for a few months or sometimes longer, so it's incredibly helpful to have such an extensive collection of recipes to choose from. This book has EVERY type of recipe covered, with appetizers and snacks, beverages, dressings and sauces, salads, soups and stews, vegetables, poultry, seafood, beef and lamb, and sweet treats. I hope that after you get a taste for how amazing the recipes are in this cookbook that you purchase a copy for yourself. This is an invaluable resource for anyone following the autoimmune protocol and will save you time and frustration in the kitchen. First up is the garlic "mayo" (seed-free, egg-free) that serves as a base for the chicken salad. You can also use it as the mayo in my Venezuelan reina pepiada (chicken avocado salad), as a dipping sauce for fried or grilled vegetables, mixed with vinegar for a salad dressing, or any other way that you would traditionally use regular mayonnaise. A versatile egg-free, seed-free, vegan, autoimmune paleo mayonnaise! Place all of the ingredients in a blender and blend on high for a minute or two, until a thick sauce forms (when freshly made, it should resemble the consistency of conventional mayonnaise). If the sauce is too thick, thin with water until the desired consistency is reached. NOTE: In order to measure the coconut concentrate, it is best to soften it in a warm water bath before use as it is solid at room temperature. Storage: Keeps well in the refrigerator, but hardens. Let come to room temperature or warm to soften before using. Now that you've made a batch of the garlic "mayo" you are all set to whip up a batch of Mickey's curried chicken salad. It tastes great as a topping for a bed of mixed greens, but my favorite way to eat it is as the filling in a flat bread sandwich (recipe for that down below!) I am not usually a fan of raisins, but they are the perfect addition to round out the flavor profile of this recipe. I love it! Note: This recipe uses a lot of turmeric. And turmeric is amazing stuff! But, in order for your body to absorb it and actually utilize it (i.e. to make it bioavailable), you need to consume it alongside ground black pepper. Black pepper is one of those gray-area foods on the AIP. It's not a nightshade, and it's not a seed. It's a type of fruit known as a drupe; coconuts, apricots, nectarines, peaches, olives, mangoes, etc. are all drupes, too. But, there are reports of people having sensitivity to it. Human clinical trials have shown that curcumin (the active compound in turmeric) is very poorly absorbed by the gastrointestinal tract, but that by consuming piperine (the active constituent of ground black pepper) with it increases the bioavailability by 2000% (source). Unless you have some sort of allergy to piperine or black pepper, it's best to consume it alongside turmeric (or any curcumin supplement you may be taking) to ensure that you are getting the full benefit! Curcumin has antioxidant activity, increases glutathione levels, is anti-inflammatory, and shows promise as a treatment for various types of cancer, inflammatory diseases like rheumatoid arthritis, cystic fibrosis, and Alzheimer's disease (source). A well-spiced curried chicken salad full of beneficial turmeric! Soften the mayo in a warm water bath until it is a liquid. Combine the mayo, vinegar, lemon juice, turmeric, ginger, and salt in a large bowl and whisk to combine. Add the chicken breast, red onion, and raisins. Stir o combine. Serve garnished with chopped parsley. Storage: keeps in the refrigerator for several days. It's super simple. Just make a batch of the chicken salad and a batch of The Domestic Man's AIP flatbread, cut it into squares, stuff with chicken salad, and enjoy! I recommend erring on the side of slightly undercooking the flatbread so that it does not become too crunchy and brittle. If it does turn out brittle, that's ok! Just use the pieces to scoop up the chicken salad. It is an AH-MAZING flavor combination! You can make both recipes ahead and pack this as a to-go lunch (I recommend storing the salad separately from the bread until you are ready to eat, though). ENJOY!! Recipe notes: you can sub water for the coconut milk in a pinch and it works fine. Also, I have stopped heating the coconut milk or water when making this flatbread. It doesn't make any noticeable difference to me in taste or texture and it saves a step and a dirty pan on the stovetop! Sign up with your email address to receive news and updates from The Curious Coconut.